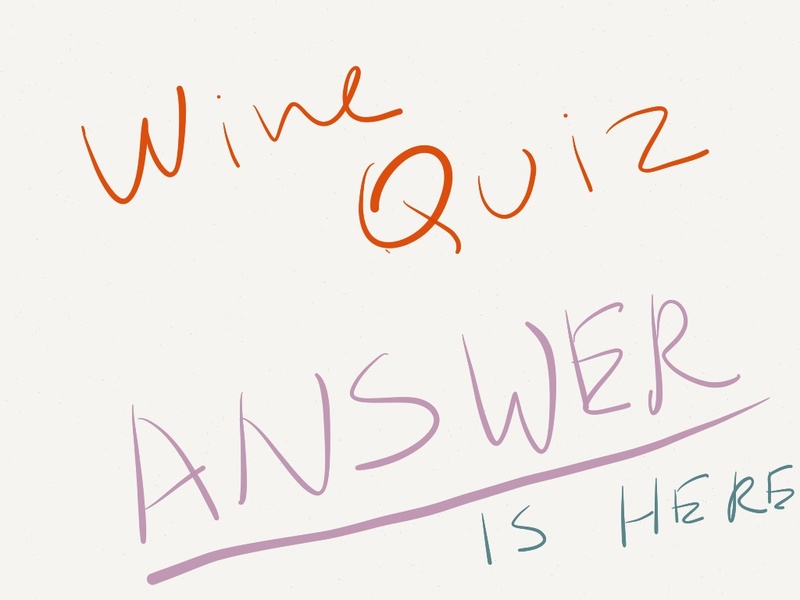 First, let’s start with the answer for the wine quiz #74, grape trivia – Trebbiano. Q1: Ugni Blanc is a main grape in the production of what famous spirit? Q2: Name the wine, in which Trebbiano was a required part of the blend, and it was considered to be the reason for a bad, flabby quality of that wine (it is no longer required to be used in that wine). A2: Chianti. For the long time, Trebbiano was a mandatory part of the Chianti wines, rendering them dull and uninteresting. Q3: Trebbiano is often a foundation for the popular food product (containing no alcohol). Do you know what food product it is? A3: Balsamic Vinegar! Yes, of course when you look at the literally a black-colored balsamic vinegar, it is hard to imagine that it is made out of the white grape juice – but all the color comes from the ageing in wood. Trebbiano is a popular choice due to its neutral taste characteristics. Q4: Contrary to the name, Trebbiano di Lugano is not considered to be a part of the Trebbiano family, but rather related to another Italian grape. Do you know what grape is that? A4: Verdicchio. Based on genetic analysis, it is established that Trebbiano di Lugano is a close relative of Verdicchio grape from Marche region in Italy. Q5: When used for the wine production (as opposed to the distilled spirits), Ugni Blanc is rarely used on its own – it is typically a part of the blend. Name 3 grapes, traditional blending partners of Ugni Blanc. A5: Sauvignon Blanc, Muscadelle, Sémillon. While other combinations are possible, I was looking for classic Bordeaux lineup, which are these three grapes. Now, when to comes to declaring the winners (or not) of this quiz, the becomes somewhat of a challenge. Both Michael (who has no web site) and Eat with Namie answered first 4 questions correctly, and provided a different answer to the question #5, compare to what I was looking for, but I can’t fully disqualify their answer. So we don’t have an absolute winner this week, but both Michael and Namie get an honorable mention. Well done! First and foremost, 3rd Monthly Wine Writing Challenge (#MWWC3) concluded with 15 entries, taking on a difficult theme “possession”. Now it is your time to chose the host for #MWWC4, a.k.a. The Winner of #MWWC3. Here is the post from Sally, the winner of #MWWC2 and the host of #MWWC3, which summarizes all the entries. Your job is simple: 1. Get glass of wine. 2. Read. 3. Vote. Yes, don’t forget to vote! Now, if you live in a close proximity of Greenwich , Connecticut, or plan to visit the area, here is the event you don’t want to miss – Greenwich Food and Wine Festival, taking place over 3 days, October 3 – 5. In its third year, the festival brings together more than 90 restaurants and vendors, chefs, musicians, sommeliers. You will find great food, great wines, cooking demos by celebrity chefs such as Duff Goldman, live music, BBQ, beer, competitions (had enough?) and more. For the schedule of events and tickets please click here. Next – do you think some wine labels are going too far? Too suggestive, too sensual, simply indecent? May be some are. Take a look at Tyler Colman’s, a.k.a. Dr. Vino, blog post on the subject. Make sure to check the link to his article in the Details magazine – you will find some interesting labels there. And the last one for today – another installment of Wine in China is available for your reading pleasure on the Wine Economist blog. This time you can learn about Chinese government involvement and its role in shaping up the Chinese wine industry. Learned a lot from the quiz – got me thinking. Off to read the article about wine in China – thanks for the link (and the shout out). Yeah~thank you! For the Q#5. I didn’t understand the Q properly. Any articles about wine production in China make me coil. Wine as a commodity or collectable is just wrong…. Wine is culture and pleasure. Not for money. I am too far from all the wine events happening around the world! Thank you, as always, for intriguing and informative articles. No issues with the quiz, you did fine!